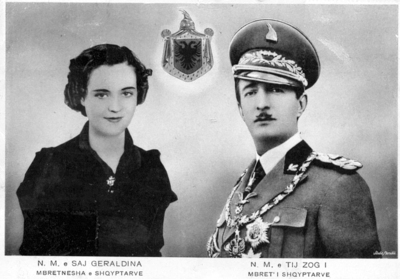 Read about King Zog of Albania, Carl Johan Bernadotte - the last surviving great-grandchild of Queen Victoria, King Ludwig II of Bavaria and about Maria Krasinska who almost became Queen of Sweden and Norway. Family album: Schleswig-Holstein. 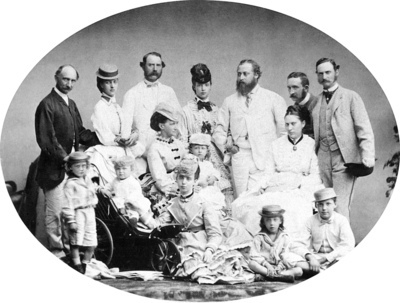 Duke Wilhelm of Glücksburg's fourth son, who became Kingh Christian IX of Denmark, with two of his brothers and members of his own family in around 1869; (behind) Wilhjelm of Glücksburg; Alexandra Princess of Wales, King Christian IX; Princess Dagmar, Tsarevna Maria Feodorovna of Russia; The Prince of Wales, Prince Johannes (Hans) of Glücksburg; Crown Prince Frederick of Denmark. 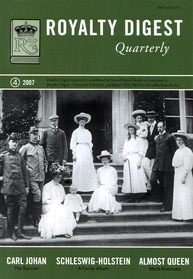 (centre) Prince George of Wales, Grand Duke Nikolai Alexandrovich; Queen Louise of Denmark holding her granddaughter Princess Louise of Wales; Louise, Crown Princess of Denmark. (seated on the ground) Princess Thyra of Denmark; Prince Albert Victor of Wales; Prince Waldemar of Denmark.